Get Jodi's "8 Ways to Bring Mindfulness to Your Life"
Want to learn a simple way to manage anxiety and calm your mind? This retreat is for women who need a morning to rest, rejuvenate and spring into spring with a mindful attitude and zest for life. Learn meditation and other mindset shifts that will bring more peace and ease into your day to day chaos. Meditations will include sitting, walking and lying down, and mindfulness exercises will be taught to help manage difficult thoughts, feelings and sensations. You will leave with tools and techniques to have a stress less, self-compassionate spring. All levels welcome. Jodi is inspired by Jon Kabat-Zinn, PhD.,who studied Buddhist philosophy, and made it accessible to us by creating a secular and scientific based program called Mindfulness Based Stress Reduction. Kabat-Zinn founded this program at University of Massachusetts Medical School, which is now taught throughout the country and world. $75 early bird before April 1st. $85 thereafter. Beginners welcome! Instruction will be given. Great place to learn! Mindful Is the New Skinny- How to lighten up inside and out- for good! Join psychotherapist and holistic health coach Jodi Baretz for a meditation and to learn a sane and sustainable approach to ending the love-hate relationship with food and equally important, with yourself. Baretz will share tips and techniques to change your mindset, curb unrealistic perfectionism, tackle cravings and combat stress for a happier, healthier, lighter you! Mindfulness Retreat with "Maximize Your Talent"
Join psychotherapist and holistic health coach Jodi Baretz for a meditation retreat where we will learn mindfulness concepts and how to meditate to fit into your crazy busy life. Treat yourself to an afternoon where you take a break from the daily chaos and learn mindset and techniques to decrease stress and increase joy. Athleta Scarsdale , Sunday, January 13th, 10:00am -2:00pm POSTPONED!! TBD. Jodi will touch upon the too many demands and unrealistic expectations of perfect body and perfect life that women feel pressured upon to effortlessly "have it all". Stressed and overwhelmed, we often become burned out on diets, workloads and family obligations that create an inferior body image and a negative self-worth. 10 transformational steps for feeling lighter inside and out. A new way of thinking that will help you reduce stress and improve relationships. Meditation instruction and meditations from the book. Mindful eating, an intuitive approach to food without dieting. 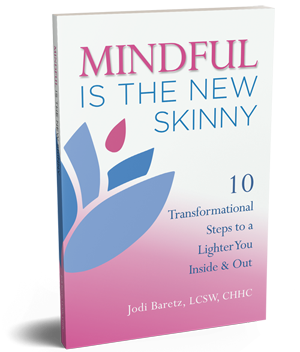 This retreat will be a combination of meditation and discussion from Jodi’s new book, “Mindful is the New Skinny,” 10 transformational steps to a lighter you-inside and out. Jodi’s mission is to introduce you to mindfulness and meditation in a relatable way, with short effective techniques to reduce stress and improve relationships with your kids, spouse, body and self. No prior meditation experience required. Jodi's Programs and ongoing groups can be found in the Programs section. Unless otherwise noted, programs and events held in Mt. Kisco or Millwood, located in Westchester County, New York, near Chappaqua, Briarcliff Manor, Pleasantville, Armonk and Bedford.